Never in my life have I driven a car that got more attention than this one. It’s a Honda with a sticker price under $35,000, but you couldn’t tell that from the enthusiastic reaction it got everywhere it went during my week behind the wheel. The “car guy” crowd goes nuts every time they see it, even more so than with the exotic Italian cars and $300,000 Rolls-Royce I tested. Why is that? Because it’s a Civic Type R, a car with an almost mythical reputation among people who know Japanese performance machines. For those who don’t know its history, the Type R name dates back to the early 1990s as a way for Honda to denote its highest performance models, typically with reduced weight, extra power and crazy-looking aerodynamic improvements. For more than 20 years, the Civic Type R has only been sold outside the United States, leaving its fans here to make do with pictures, video games and occasional gray-market imports to gawk at. The Honda Civic Type R is covered with aerodynamic slits and winglets, and they’re not just decoration. Honda says they’re all designed to be functional, including its giant rear wing that reduces lift at high speeds. Now, for the first time, Honda is making its coveted super-Civic available to American buyers. 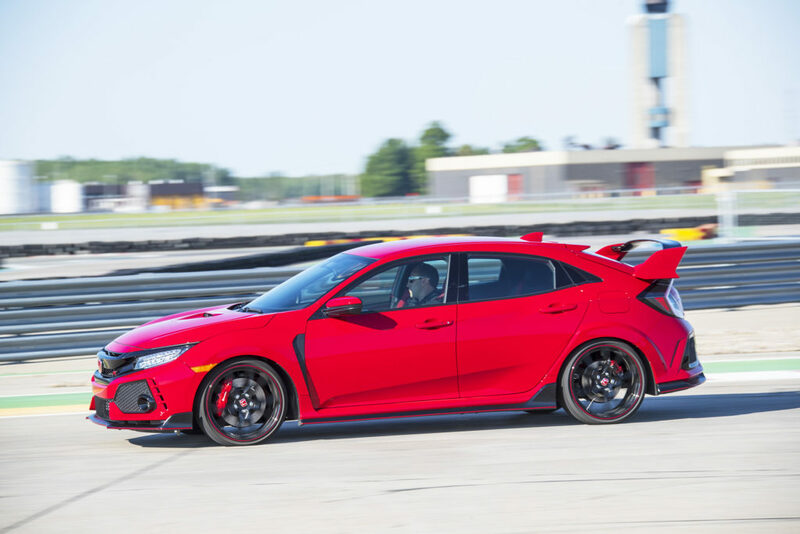 I’ve driven a lot of fast cars through the years — including a number of the Type R’s hot competitors, such as the Ford Focus RS and Volkswagen Golf R — and none of them quite match up to the mind-blowing experience you get in the Honda. That’s because the Type R is about much more than raw power. Like all performance compacts, its formula starts with a ridiculously powerful engine. Its 2.0-liter, four-cylinder, turbocharged powerplant makes 306 horsepower and 295 pound-feet of torque, both insanely high numbers for a car this light. What sets the Type R apart, though, is how it sends all that power to the pavement. It uses a six-speed manual transmission and helical limited-slip differential to route power to the front wheels, something that’s usually a recipe for torque steer — the tendency for the steering wheel to pull left or right when you mash the throttle. Honda’s engineers figured out how to eliminate that problem better than any front-wheel-drive performance car I’ve ever driven, though. The Type R has a unique steering system, along with adaptive dampers and monster brakes, that combine to force you to recalibrate what you think you know about driving a fast car. This car corners so fast, with so much grip, that it’s hard to wrap your brain around just what it can do. But don’t take my word for it. Look at the lap records it’s setting. The Civic Type R is the fastest front-wheel-drive production car ever to tackle the storied Nurburgring racetrack, setting a record of 7 minutes, 43.8 seconds on the 12.9-mile historic loop in Germany earlier this year. Racing-style seats with high bolsters play an important role in a vehicle designed for track use. The Civic Type R is designed inside and out around one goal: speed. A big reason for that is the aerodynamic package Honda designed for the Type R. It’s covered from top to bottom, front to back, in all kinds of crazy slits and winglets, all of which Honda swears are functional, not just for looks. They’re all designed to dissipate heat, reduce drag or add downforce. In fact, with a price around $34,000, I like to joke that it’s a true bargain at $1 per winglet. The wild-looking Type R takes on a surprisingly docile demeanor, though, when you switch its drive setting into comfort mode. It changes from a snarling, track-focused beast to a reasonably smooth-riding, easy-to-drive commuter car. Still, my favorite thing to do with the Type R was keep it in its most aggressive setting — +R, they call it — and enjoy all the visceral sounds and feelings that come with its wailing engine and stupid-fast cornering capability. Assuming you don’t mind its Fast-and-Furious looks and you can handle throngs of car geeks wanting to check it out in parking lots, it’s the perfect car for people looking for extreme performance on a realistic budget. It’s an incredible performance bargain, offering attention-getting, supercar-like looks and sensations with a sticker price under $35,000.